There’s been a flurry of attention on forest bathing recently. Originating in Japan, it is the practice of taking a trip into the forest for well-being benefits. Last year we completed a meta-analysis of 11 Japanese research studies into forest bathing, it was published open access in Evolutionary Psychological Science. The paper considered the results in the context of a ‘3 Circles’ model of emotional regulation that helps reveal why immersing oneself in the woods is good for health. The surprising thing about the previous research was that it tended not to consider emotions – yet trees bring joy and calm to many! Instead they tended to focus on the nervous system and stress reduction theories. The ‘3 Circles’ model combines the function of our nervous system with our emotion regulation system, therefore giving a fuller understanding of the benefits. Our re-analysis of the previous forest bathing research showed the results (and some inconsistencies in them) could be explained by the ‘3 Circles’ model. So, let’s take a look at the ‘3 Circles’ model! Each dimension brings different feelings (such as anxiety, joy, and calm), motivations (avoid, pursue and rest) – releasing various hormones in the body. For wellbeing we need a balance between the three dimensions – happiness and satisfaction comes through balancing threat, drive and contentment. 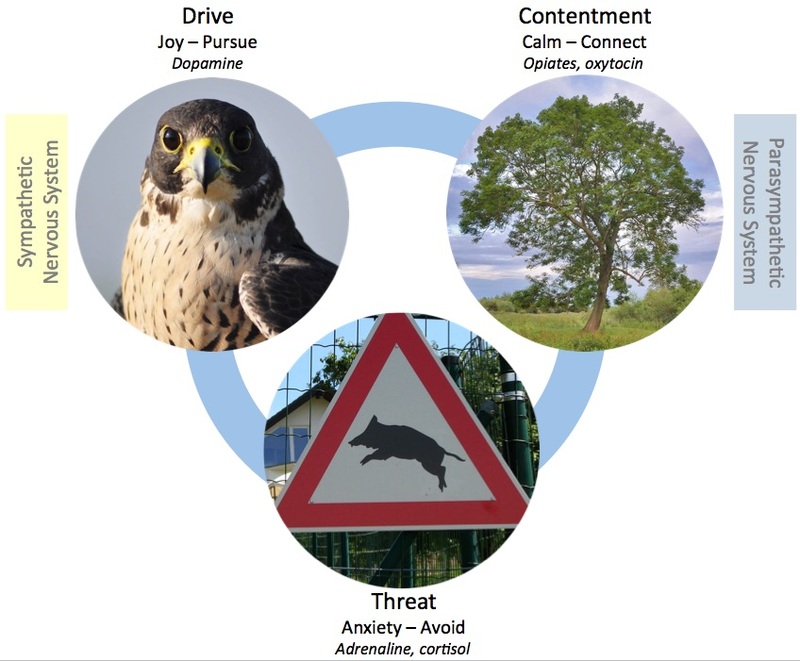 For example, when our threat response is overactive, an unbalance caused by being constantly driven for example, our positive emotions are reduced and we can become anxious or depressed. 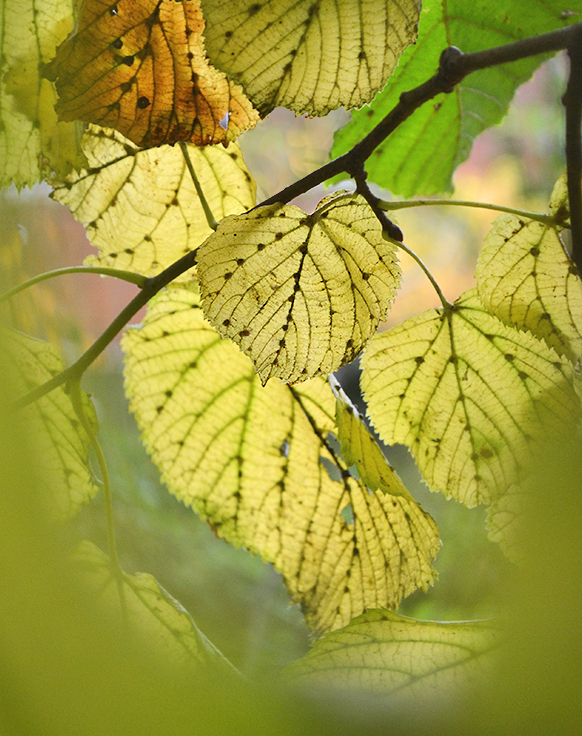 Returning to the forest bathing research, we focussed on those studies that measured heart-rate variability – an indicator of activity in the branches of the nervous system that controls the heart. Although these studies found differences in the responses to urban and forest environments they didn’t consider them in the context of emotional regulation – how nature links to emotion, physiology and well-being. Nor did they have compelling explanations for some variety in the results. The results of the analysis supported the story told by the 3 Circles model. Finding that being in the woods was calming – activating the parasympathetic nervous system associated with contentment. Whereas the urban control environment they used stimulated the sympathetic nervous system associated with drive and threat. As ever the story is a little more complex. Some people weren’t soothed by the woodland, others were stimulated by it. Again, the 3 circles can help explain this. Some people could experience threat in the woodland, feeling anxious about what lies in the undergrowth – is that a boar rustling? This would cause a spike in sympathetic nervous system activity. Those more in tune with nature could feel joy (rather than calm) at being asked to spend time in the woods – at any time an exciting falcon may fly past! Such joy would also raise activity in the sympathetic nervous system. Understanding how exposure to nature impacts our bodies and how this links through to mental well-being helps establish the types of activities in nature that are most beneficial – and convince others that nature is linked to health. One key thing our analysis highlights is that exposure to nature is emotional – the brain feels before it thinks. And these emotions have a physiological basis – which nature and well-being research often overlooks. Such knowledge and models can guide us, for example in the types of nature based activities we provide for people – realising we can move beyond identifying nature to finding joy and calm – and balance in nature. This also highlights another key thing often overlooked in research into the benefits of nature – there are two types of happy! In sum, forest bathing research evidence supports the use of the 3 circles model to explain how the body reacts to exposure to nature. The model shows how nature brings balance to our feelings and the nervous system that controls the function of our body, and organs such as the heart. Balance of emotions brings wellbeing, and regulation of heart rhythms helps heart health. Forest bathing and the ‘3 Circles’ model tell the story of how nature brings two types of happiness to keep us well.